For typographers and designers of fonts, the software program "FontLab" has become the premiere font-creation program of our time. Highly sophisticated, FontLab operates on Windows and Mac (systems 9 and OSX) and offers more up-to-date features-such as OpenType support, class-based metrics and kerning, as well as an impressive array of bezier drawing tools-than any other font design program. Author and designer Leslie Cabarga (who also wrote The Logo Font ' Lettering Bible) packed Learn FontLab Fast with illustrations, diagrams and screenshots, and cut the text to a minimum so learning to create fonts that you can load onto your own computer and/or distribute commercially becomes easy and enjoyable. 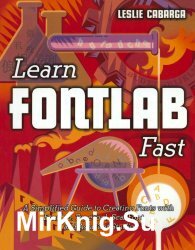 Learn FontLab Fast explains the techniques used by five established font designers to create their own fonts. to making OpenType fonts with special features and organizing those features into classes. The book also features an extensive, cross-referenced "find-anything" Index. Whether you are a FontLab and TypeTool beginner, or an experienced user, Learn FontLab Fast covers virtually everything you need to know.